Rapid growth of urbanization across the globe is changing the way of using devices and things present in the technological environment. Internet of Things (IoT) includes the devices, services and solutions which have connectivity feature with internet. The devices are embedded with sensors, chips, and others to enhance the user’s experience. These devices and services are efficient to operate various tasks with less time consuming methods. The growing trend of internet enabled devices and rising need of internet connectivity are some of the major factors which are anticipated the positive growth of internet of things market globally. Technological advancements in semiconductors offer the advantages to develop lightweight and efficient devices which are much smarter than the conventional and heavy devices. Rapid advancements in manufacturing, electronics and IT sectors across the globe are gaining traction from consumers which in turn intensified the demand for internet of things (IoT). Increasing usage of internet along with rising penetration of smart phone users around the world is one of the prime factors behind the positive growth of this industry. The global internet of things (IoT) market reached USD 598.2 Billion in 2015 and the market is expected to reach USD 724.2 Billion by 2023. Further, the market is projected to register a CAGR of 13.2% during the forecast period 2016-2023 globally. The internet of things comprises components and devices that enable connectivity and exchange of information. Expansion of e-commerce sector and shifting of industries towards applications and online helping portals for the customers are the major reason behind the growth of this industry. However, consumer electronics segment accounted the market share of 32% in 2015 of overall market of internet of things. Rapid adoption of internet connectivity enabled appliances such as washing machines, microwaves, televisions, etc. and ease of operating of appliances through remote operating facility are the prime features which are expected to uplift the market of internet of things (IoT). On the other hand, North-America (especially United States) is expected to maintain its revenue share of 24.2% during the forecast period i.e. 2016-2023. While, Europe region is expected to generate more revenue and will jump from 12.2% in 2015 to 20.2% by 2023. Increasing adoption of advanced devices and implementation on healthcare IT in both the regions are expected to drive the demand for internet of things in near future. Moreover, importance of internet of things (IoT) is growing in industries and government organizations owing to rising need of remote monitoring systems and internet enabled devices. These devices and systems enabled to operate efficiently and served better to their consumers. Likewise, consumers are creating a huge pressure to increase the consumption of internet of things on industries by adopting smart devices to reduce the time for various processes of buying, shopping, etc. The internet of things (IoT) comprises connected vehicles, wearable electronic devices and other electronic appliances that can be connected through internet and operate from remote locations. Wide-scale availability and diversity in technological devices are providing ease to the consumers to adopt latest technology. Increasing tech savvy population across the globe is increasing the demand for internet of things (IoT) globally. The market of internet of things (IoT) is majorly driven on the back of rising investment by tech giants in internet of things industry. Several IT companies are collaborating and investing to establish innovative laboratories to increase product applications. These laboratories and increasing tech startups across the globe are focusing towards affordable and advanced smart devices with internet connectivity. 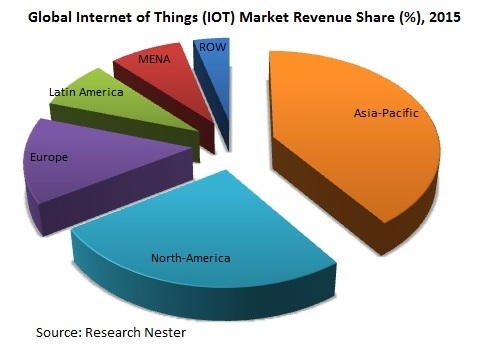 These factors are expected to foster the growth of internet of things (IoT) market during the forecast period i.e. 2016-2023. Rising demand for advanced consumer electronics in growing economies, increasing adoption of smart devices due to hike in personal disposable income and growing need of internet enabled devices are some of the major factors which are swelling the demand for internet of things globally. Apart from this, rising industrialization and advancement in healthcare industry which gives rise to tele healthcare services across the globe sequentially raise the need of internet of things from consumers end. Rising penetration of smart devices and growing trend of social networking in developed and developing nations is the major growth driver for this industry. Moreover, emergence of automation technology in various sectors such as manufacturing, production, etc. has given a rise to the adoption of internet of things based technology devices and robots. However, issues related to security and privacy of data and connectivity of devices is the major restraint for the market which is creating cynicism among the consumers. Likewise, lack of awareness in undeveloped region and dearth of internet connectivity are the key factors which are hampering the growth of this industry.